Bayern Munich and Juventus maintained their relentless pursuit of domestic titles in Europe this weekend. Barcelona suffered a second successive league defeat to offer some hope to their Spanish rivals and Paris St-Germain, already crowned as French champions, won again in Ligue 1. And striker Mario Balotelli was criticised again for his performances at AC Milan, where he is on loan from Liverpool. But what else happened around Europe? BBC Sport rounds up the stories you may have missed. Real Madrid's dressing-room celebration picture following last weekend's El Clasico win against Barcelona is still causing amusement for some and anger for others. Dutch second-tier side Almere City saw the funny side and tweeted their own tongue-in-cheek version of the Real picture, which featured Cristiano Ronaldo, sans shirt, showing off his physique. Almere's version included reserve goalkeeper Roy Pistoor in the role of Ronaldo, showing he has some way to go to match 'CR7's' six-pack. 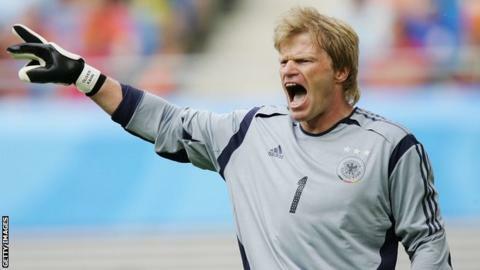 But former Germany international Oliver Kahn, who has never been shy of criticising Real, was less amused. "Lately, I've been seeing more of Cristiano Ronaldo's six-pack than my own wife's breasts," he complained bizarrely to German public broadcaster ZDF. As if life as a Newcastle fan was not depressing enough this season, one St James' Park old boy seems determined to rub salt into their wounds. Hatem Ben Arfa gave the Toon faithful another glimpse of his talents on Sunday with a superb hat-trick for Nice against Rennes to continue his fine form since leaving Tyneside. After falling out of favour at Newcastle and spending time on loan at Hull, Ben Arfa was released last January. He has since rebuilt his career back in his native France and his 16 goals this season make him second top scorer in Ligue 1, behind Zlatan Ibrahimovic. Sousa a man in demand? After just one season in charge of Fiorentina, former QPR, Leicester and Swansea manager Paulo Sousa is struggling to shake off rumours that he could be on the move again. Following links with AC Milan, and stories that he was unhappy with a lack of transfer activity in Tuscany, the Portuguese has been forced to answer claims he met representatives of Russian club Zenit St Petersburg. "I cannot justify myself every time I go out for dinner," said Sousa. "I have a contract and I am the coach of Fiorentina. We have seven games and 21 points at our disposal, so I am concentrated only on that. "Could I open a new era with Fiorentina? A coach doesn't just train the players, he needs to have a complete 360 degree vision, and so far this is what I have done." Julian Nagelsmann might be one of Europe's youngest top-flight coaches, but the 28-year-old has wasted no time building a big reputation since taking over at struggling Hoffenheim. After being lined up to take charge next season, Nagelsmann was promoted ahead of schedule in February. The job came his way as Huub Stevens was forced to step down because of heart problems after just four months at the helm. Nagelsmann has since won five and lost just two of his nine games in charge, to take a side who were joint bottom at the start of his reign to 14th place, four points clear of the automatic relegation spots. He enhanced his reputation further on Saturday when Nadiem Amiri and Mark Uth - two substitutes he introduced during the game - scored in a 2-0 win at Eintracht Frankfurt. In his first home game since succeeding Gary Neville as Valencia manager, Pako Ayesteran is up and running after claiming victory against Sevilla. Alvaro Negredo struck in stoppage-time against his former club to give Valencia a 2-1 La Liga win. Daniel Parejo's deflected free-kick in the 41st minute opened the scoring for Valencia, who had not won in La Liga since 2 March, but Kevin Gameiro equalised in the 86th. Neville was sacked on 30 March after less than four months in charge.